70mm of EPIC WIN -- times two! Contrary to popular belief, it does rain in southern California. We’re in the middle of what is projected to be a solid week of rainy weather. Today we had thunderstorms and a small tornado even came ashore in Orange County. So I hadn’t planned to get any observing done until after this coming weekend. Rather, I should say that I hadn’t counted on getting any observing in. But I had hoped that there might be some breaks in the clouds, and I had planned accordingly. The point of generating all of the AL observing club logbooks was to have all my ducks in a row when the sky cleared up this rainy season (I can’t bring myself to call it “winter”, and we really only have two seasons anyway, rainy and dry). By the way, it may look like I’ve gone completely mad for AL observing clubs, with six active projects. But there’s a lot of overlap; some observations for the Messier and Deep Sky Binocular clubs also count for the Urban club, and Deep Sky Binocular work is basically observing the brighter NGCs that never made it into the Messier list, so except for the Galileo and Lunar II clubs, all of my observing projects involve hunting down faint fuzzies. And they all can be done with binoculars, at least to a point, although ‘nokks are only required for the two clubs with ‘binocular’ in the title. ANYWAY, this evening the clouds cleared out for a bit so I grabbed my observing kit and headed out into the driveway to hunt for goodies. What’s in my binocular observing kit? Glad you asked! 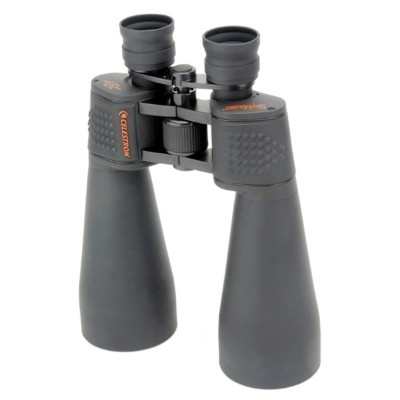 My ‘nokks of choice, Celestron SkyMaster 15x70s . These are big, and they really gobble up the photons. The views are sharper when they’re mounted, but I prefer the freedom of handheld scanning, and that’s how I use them most of the time. If I’m going to use smaller binoculars on a given evening, I have to do so before I look through these; going back to 50mm of aperture is like having someone shut off the lights. Huge bang for the buck, but if you’re going to freehand them, get a wide padded neck strap instead of the shoelace guillotine that comes included. Sky & Telescope’s Pocket Sky Atlas . I love, love, love this atlas. It’s small enough to hold in one hand, spiral bound to lay flat or fold over in the field, easy to read with a red flashlight, conveniently organized…with this atlas, my 15x70s, and reasonably dark skies, I can ‘nokk off DSOs about as fast as I can look them up on the charts. In the city I can’t always see the faint fuzzies, but I can always get myself to the place in the sky where they would appear if I wasn’t under the LA light dome. Notebook. I use a hardbound 8×5 off the bargain rack at Borders, but anything would do, even a blank piece of paper. At the top of the page for each observing session I note the date, location, and sky conditions. Entries include time, instrument used, target, and a brief description. I transcribe everything into my AL logbooks after I come back inside, because its easier to do that than juggle four floppy 8×11 notebooks in the field. Red flashlight. Mine is a Mini Maglite with the window painted over with a double coat of red nail polish. I wear it around my neck on a lanyard so it’s always to hand. Bright enough to let me use the atlas and record my observations without trouble, small enough to fit in my teeth when I’m laying on my back and two-handing the atlas overhead. Writin’ iron. I use the cheapest stick pens that money can buy, so I don’t have to worry about breaking or losing them, but whatever you like will do. Hooded sweatshirt. Surprisingly useful. Not only keeps me warm, I can stash the binocular lens caps in one pocket and my pen in the other. The biggest benefit is being able to pull the hood around my face like a cowl to block out stray light and improve my eyes’ dark adaptation. This makes a BIG difference in seeing faint stuff I would otherwise miss. Patience, and knowing I’m looking in exactly the right place (thanks to the atlas) are the other two legs of this triad. Towel or folding chair. Depending on how my targets are. If low in the sky, I may choose to sit in a folding chair. If high in the sky–where I prefer to work, both for ergonomic reasons and because things look the best when you’re looking straight up, through as little atmosphere as possible–I lay a beach towel on the car and lay back against the windshield. The towel keeps me warmer than I would be otherwise and keeps me from scratching up the car. That’s it. For walking out the door, I’ve got the sweatshirt on, binoculars and red flashlight both hanging from their neck straps, pen in my pocket, atlas and notebook in one hand, towel or folding chair in the other. I’m outside in one trip, and observing about 5 minutes after the mood strikes. That comes in handy on nights like tonight; between 5:30 and midnight I was out four times, because the sky was clear four times and cloudy three times in between. It would not have paid to set up a telescope, and I would not have felt comfortable doing so considering the amount of moisture still falling down out of the trees–when the slightest breeze hits the tall palm in my front yard, it shakes itself like 60 feet of wet dog. So it was ‘nokks or nothing, which suited me just fine because I’ve been on a serious binocular observing bent lately. I spent the first session ‘nokking off some easy Messiers. Nothing new, all things I’d already seen and logged from the Salton Sea and just needed to dupe for the Urban Club. Still nice to check those off the list. The rest of the sessions I was hunting clusters. I’ll give the full run-down on how I do this in another post. Suffice to say that by the end of the night I had logged 24 DSOs, including 15 objects that I’d never seen before. Some of them were just gorgeous–there is a nice run of little clusters off the feet of Gemini that must been seen to be believed. Plus I got in some sweet views of the moon and had a quick peek at Mars and Saturn, too. Now it’s late and I’m bushed, so I and my victory energy are going to bed. Catch you on the flip side. thanks a lot for the post, really helpful for a beginning star gazer. I particularly appreciated the heads up about the star atlas, which having now bought I find to be really excellent. Thanks for the kind words. Glad you like the atlas. I think it is one of the best things ever produced for amateur astronomers. For many casual observers, it may be the only atlas they will ever need. I certainly won’t outgrow mine anytime soon–for one things, objects too dim to list in the PSA are probably beyond the reach of any of my current telescopes! Given your location, you might be interested in the IFAS Observing Challenges. I understand that Scotland is in a different country, and you’re probably not eligible for the IFAS certificates, but at least the lists are aimed at people from northern latitudes. And the binocular list in particular is well put together and would be an excellent starter project for someone with a new telescope. That goes for all you non-Scots out there too!